This tutorial was contributed by Christine Kaufhold and Francis Poulin. As a continuation of the Quasi-Geostrophic (QG) model described in the other tutorial, we will now see how we can use Firedrake to compute the spatial structure and frequencies of the freely evolving modes in this system, what are referred to as basin modes. Oceanic basin modes are low frequency structures that propagate zonally in the oceans that alter the dynamics of Western Boundary Currents, such as the Gulf Stream. 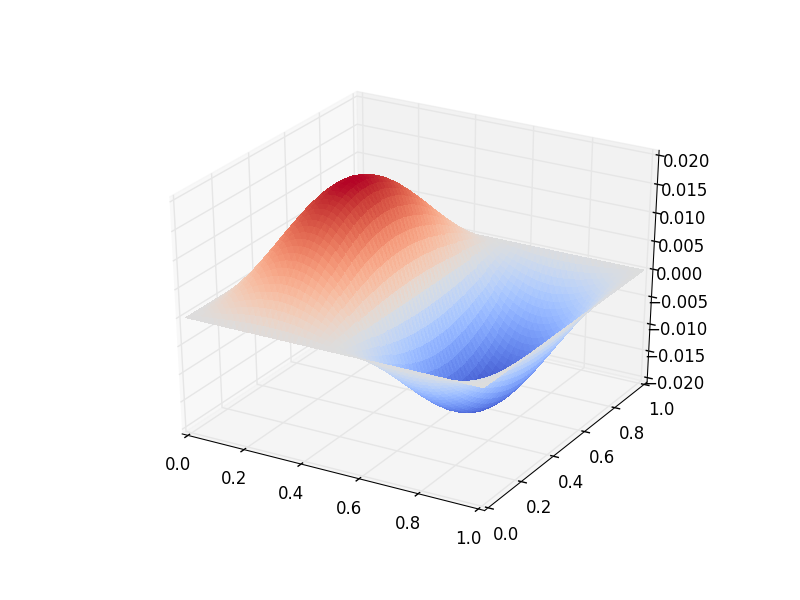 In this particular tutorial we will show how to solve the QG eigenvalue problem with no basic state and no dissipative forces. Unlike the other demo that integrated the equations forward in time, in this problem it is necessary to compute the eigenvalues and eigenfunctions for a particular differential operator. This requires using PETSc matrices and eigenvalue solvers in SLEPc. This demo requires SLEPc and slepc4py to be installed. This is most easily achieved by providing the optional –slepc flag to either firedrake-install (for a new installation), or firedrake-update (to add SLEPc to an existing installation). To use a finite element method it is necessary to formulate the weak form and then we can use SLEPc in Firedrake to compute eigenvalue problems easily. To begin, we multiply this equation by a Test Function \(\phi\) and integrate over the domain \(A\). Using this form, we can now implement this eigenvalue problem in Firedrake. We import the Firedrake, PETSc, and SLEPc libraries. We specify the geometry to be a square geometry with \(50\) cells with length \(1\). Next we define the function spaces within which our solution will reside. We impose zero Dirichlet boundary conditions, in a strong sense, which guarantee that we have no-normal flow at the boundary walls. The two non-dimensional parameters are the \(\beta\) parameter, set by the sphericity of the Earth, and the Froude number, the relative importance of rotation to stratification. Additionally, we can create some Functions to store the eigenmodes. We define the Test Function \(\phi\) and the Trial Function \(\psi\) in our function space. To build the weak formulation of our equation we need to build two PETSc matrices in the form of a generalized eigenvalue problem, \(A\psi = \lambda M\psi\). We impose the boundary conditions on the mass matrix \(M\), since that is where we used integration by parts. Next we will impose parameters onto our eigenvalue solver. The first is specifying that we have an generalized eigenvalue problem that is nonhermitian. The second specifies the spectral transform shift factor to be non-zero. The third requires we use a Krylov-Schur method, which is the default so this is not strictly necessary. Then, we ask for the eigenvalues with the largest imaginary part. Finally, we specify the tolerance. Finally, we build our eigenvalue solver using SLEPc. We add our PETSc matrices into the solver as operators and use setFromOptions() to call the PETSc parameters we previously declared. Additionally we can find the number of converged eigenvalues. We now get the real and imaginary parts of the eigenvalue and eigenvector for the leading eigenpair (that with the largest in magnitude imaginary part). First we check if we actually managed to converge any eigenvalues at all. We can now list and show plots for the eigenvalues and eigenfunctions that were found. Below is a plot of the spatial structure of the real part of one of the eigenmodes computed above. 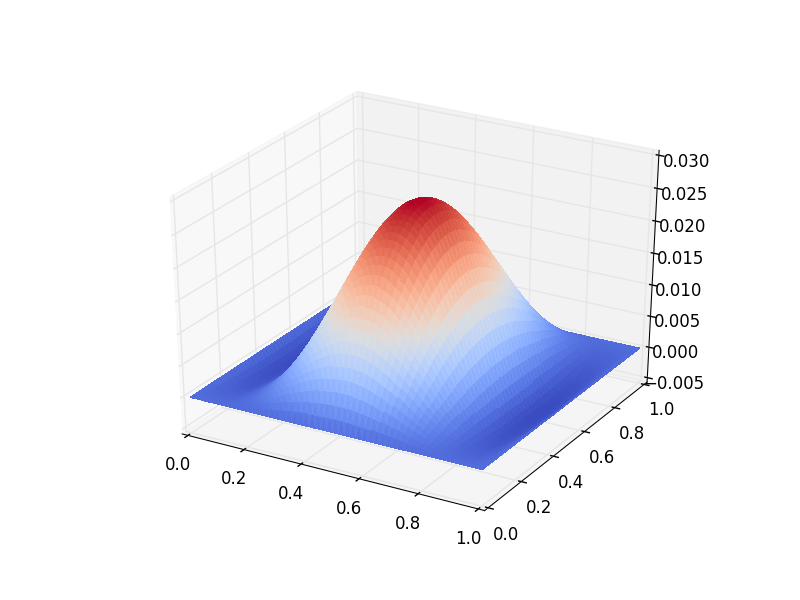 Below is a plot of the spatial structure of the imaginary part of one of the eigenmodes computed above. This demo can be found as a Python script in qgbasinmodes.py. [Ped92] Joseph Pedlosky. Geophysical Fluid Dynamics. Springer study edition. Springer New York, 1992. ISBN 9780387963877. [Val06] Geoffrey K. Vallis. Atmospheric and Oceanic Fluid Dynamics. Cambridge University Press, Cambridge, U.K., 2006.